Sestri levante hotels booking hotel liguria italy hotels holiday in italy holiday in sestri levante Welcome to the grande albergo! Welcome to the grande albergo! 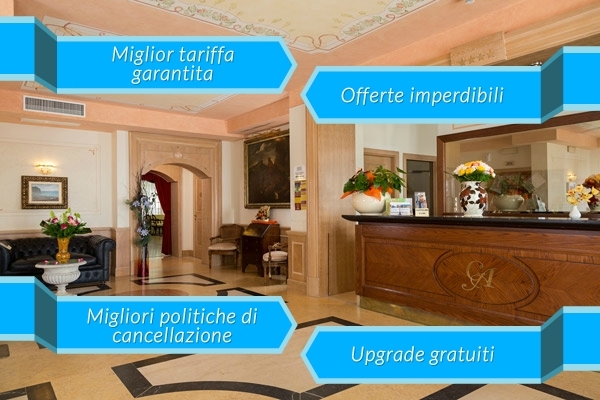 Welcome to the Grand Albergo Hotel! Overlooking the sea promenade of Sestri Levante, The Grande Albergo is now a landmark in tourism and the Gulf of Tigullio. Completely renovated in 2003, this late '19th Century historic building, has 70 rooms including 4 junior suites, all equipped with modern amenities such as internet Wi-Fi. A great base to discover the most striking places of Liguria, such as the beautiful Cinque Terre and the timeless Portofino, The Grande Albergo offers the resources to spend a relaxing holiday, whether enjoying cocktails from the panoramic swimming pool, located on the roof of the building, or simply from the balcony of one's room. The different types of rooms, from sea view to overlooking the peaceful garden, will satisfy all types of requests and our staff will be only too happy to liase and organize all the extra activities available, such as cultural visits, excursions and sports. Don't hesitate to book your holiday now!